What with all the wretchedness that comes from too deep an immersion in the craptastic nature of our politics these days, it is sometimes necessary (for me) just to stop, look up, and enjoy the view. 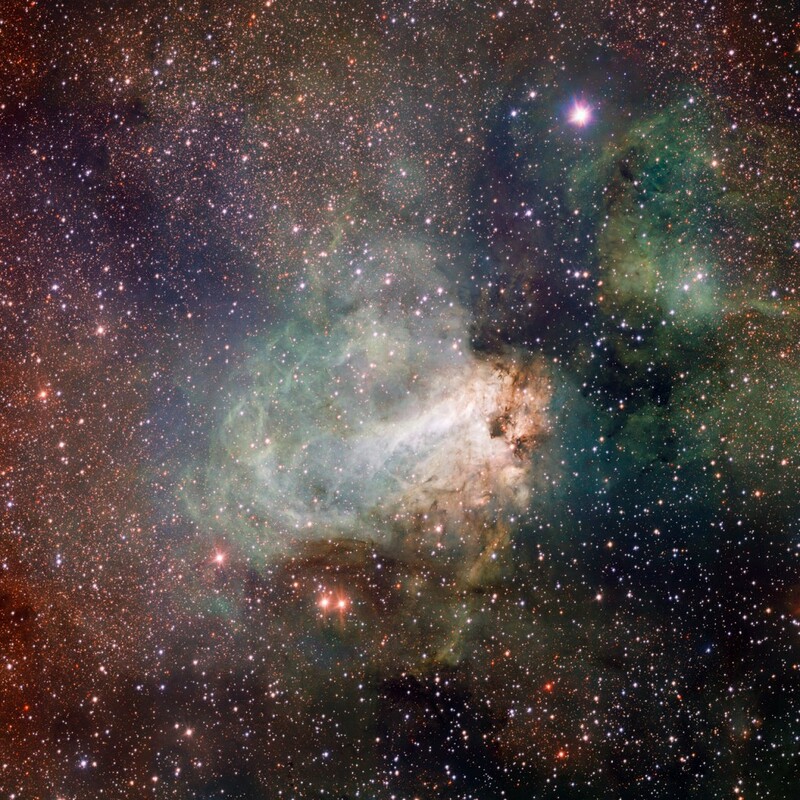 This is an image of the star-forming region Messier 17, alias the Omega Nebula or the Swan Nebula. It is the first released pic from data taken by the European Southern Observatory’s new survey telescope, the VST. It’s not large, as modern telescopes go — 2.6 meters in diameter, or roughly half the diameter of the venerable Palomar 200 inch Hale Telescope. But it’s been designed as an instrument to make surveys of significant portions of the sky with very high resolution and optical/image quality. The ‘scope boasts active optics, and delivers its photons to what sounds like the coolest instamatic ever made…with initial results as you see above. What happened on February 8? On that date in 1672, Henry Oldenburg, secretary to the Royal Society, arranged to have a letter read at the Society’s regular meeting. That letter was from the still young, relatively recently installed Lucasian Professor of Mathematics at Cambridge, Isaac Newton. The Society had reason to pay attention to Newton, for all that this was the first significant piece of his writing that had come its way. 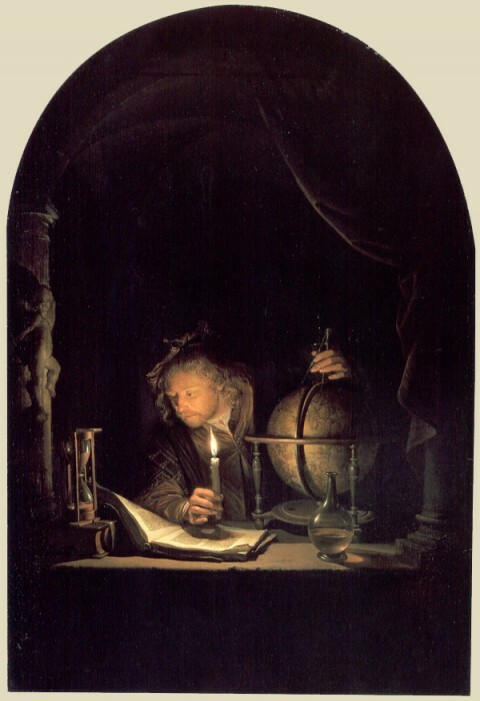 He had sent the society a working telescope of a radical new design in 1670 — and that invention propelled him from more or less complete obscurity to the first rank of those who communicated with the Society. A critical feature of this new reflecting design was the elimination of chromatic aberration — a distortion produced by the fact that the lens used in a Galilean telescope has different refractive indices for different wavelengths of light. This encounter with color and light prepared the way for what was to come. Newton would become famous for his reluctance to publish — and especially for his aversion to criticism. It took him almost two years to summon up the courage or the ambition to submit the paper that would lay out the underlying theoretical and experimental work that produced the telescope as a by-product. But at last, on February 6, 1672, he mailed his letter to Oldenburg. Two days later, the news became one of the founding documents of the public record of modern science. Newton’s letter to Oldenburg was incredibly rich in new science, but in fact, as Newton’s best recent biographer, Richard Westfall described, there was a long and in many ways very productive history of optical investigation that preceded it. So why was this one document so special? The 1672 letter was not Newton’s last word on the subject, and in the immediate context of the day, it embroiled him in precisely the kind of wrangle he loathed, a battle over the accuracy of some of its details with Robert Hooke. With hsi letter to the Royal Society, Newton laid down what would be required to do meaningful science from that point forward, from the way he designed his experiment, to the way he used mathematics in the interpretation of data, to the manner in which both results and interpretation would now need to be reported to the community. Put that another way: I’ve talked elsewhere in this blog about science as a set of habits of mind. Here Newton provides a synoptic view of how those habits work in action: the systematization of observation; the skepticism needed to put your initial results to the test; the interplay, back and forth, between evidence and theory. It’s a quibble to argue if this was the first paper we can imagine John Maddox ever accepting. 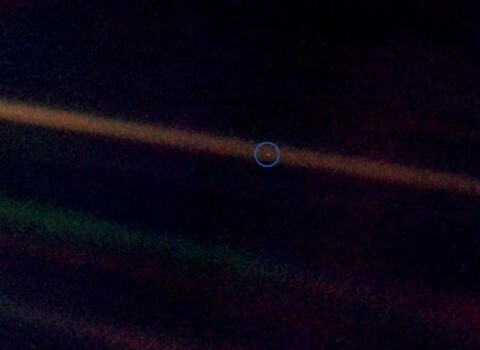 It’s a fact that this one letter from a proud and fearful man working alone in the stagnant backwater of Cambridge showed his world that there was a new way to comprehend the world. Now all we need is a name for the day. Happy Prismas anyone? Update: A bunch of minor edits to correct typos and remove some nasty word repetitions and the kind of sentence structures you get when writing something at the tail end of the Friday of the first week of term. 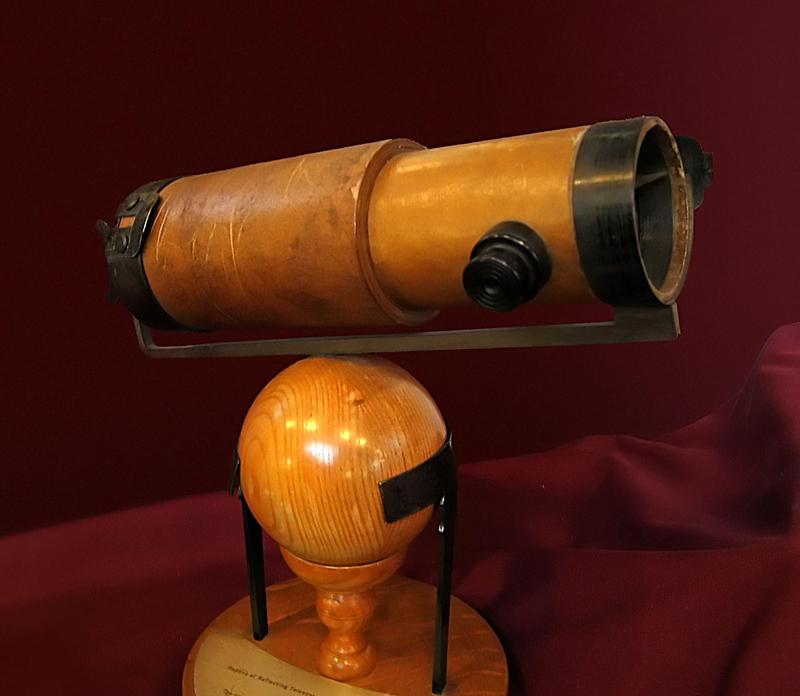 Images: Newton’s Reflecting Telescope (replica). Photograph by Andrew Dunn c. 5 November 2004, licensed under Creative Commons Attribution ShareAlike 2.0. William Blake, “Ancient of Days,” 1794. Location: the British Museum, London. Source: Wikimedia Commons.